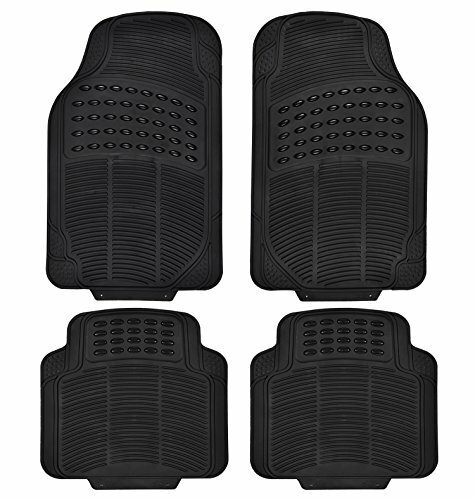 Protect your car, truck, or SUV with this premium quality 4 piece all weather rubber floor mats.Your vehicle\'s interior is constantly under siege from the elements. Easily customizable for a huge variety of make and model; cars, trucks, and suvs. Front mat: 27.5 x 17.5 inches, Rear mat: 17.5 x 16 inches Universal. Waterproof and stain-resistant.They are constructed out of the highest quality of rubber polymer.No annoying or embarrassing odors for driver and passengers. Durable and long lasting.They do not crack or deform under pressure or extreme temperatures. The heavy duty construction allows the mat to retain its shape. Easy to clean, adds protection to your vehicles interior flooring. They are super nice I am happy I order this set over there brands. These are really heavy and would cost much more elsewhere. Got them for my jeep. Look nice and easy to clean.